Luke Doucet and Melissa McClelland have enjoyed reasonably successful careers for a number years both as performers in their own right and as members of multi Grammy and Juno award winning Canadian singer-songwriter Sarah McLachlan’s backing band. 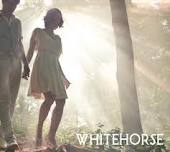 Yet this husband and wife duo are embarking on perhaps their bravest challenge to date in launching a collaboration as equal partners in the newly created act, recording and performing under the band name Whitehorse. Their self titled debut release initially hit the Canadian market last year under the Six Shooter Record label and the band are about to promote this album on their short UK tour that visits several towns and cities later this month. Live music regulars at these venues will get the pleasure of the duo showcasing this album along with its successor that is very much in the pipeline. The reason for this sharp follow up is the cautious step the band has taken in recording a relatively short album containing only eight tracks and lasting barely thirty minutes. There is an old saying, quality over quantity and after spending not a considerable amount of time on repeat listens, you really begin to appreciate the magic and potential that they have for making great records. The band has taken a bold step in deciding to bookend the six main tracks on this compact album with a couple of eulogies that give a very atmospheric beginning and end to the record. This creative feature took a few listens to get used to and while being an interesting move, it is felt the album could have been improved by adding a couple more conventional songs that the duo demonstrate they are fine exponents of. Doucet and McClelland share the song writing credits on all bar one of the album’s six main tracks including Broken where Sean McDonald collaborated as well. Also this song was featured on one of Doucet’s solo releases in 2006. The other song on the record that had been previously aired was McClelland’s heavy beat rock oriented Passenger 24 where Doucet’s electric guitar playing combines well with his wife’s vocal skills. Perhaps the most interesting track on the album is the duo’s re-worked version of the old Bruce Springsteen hit I’m on Fire in the style of an old time country duet. This slower version of a much covered song came over really well and as Melissa alluded to in a recent magazine interview,’ if you’re going to cover someone else’s song you might as well pick one of their best’. The duo’s harmonies are showcased on the up tempo track Killing Time is Murder which kicks the album into life after the opening eulogy while they show they can also conquer the tender ballad with the song Night Owls that brings the album to its conclusion just prior to the final fifty-second eulogy. The upshot of recording a relatively short quality album is to leave your audience yearning for more and it shouldn’t be too long to wait before this talented Canadian song writing and performing duo will be sharing more of their songs with audiences on both sides of the Atlantic.